Here we describe a protocol for employing high-throughput RNAi screening to uncover host targets that can be manipulated to enhance oncolytic virus therapy, specifically rhabodvirus and vaccinia virus therapy, but it can be readily adapted to other oncolytic virus platforms or for discovering host genes that modulate virus replication generally. Allan, K. J., Mahoney, D. J., Baird, S. D., Lefebvre, C. A., Stojdl, D. F. Genome-wide RNAi Screening to Identify Host Factors That Modulate Oncolytic Virus Therapy. J. Vis. Exp. (134), e56913, doi:10.3791/56913 (2018). High-throughput genome-wide RNAi (RNA interference) screening technology has been widely used for discovering host factors that impact virus replication. Here we present the application of this technology to uncovering host targets that specifically modulate the replication of Maraba virus, an oncolytic rhabdovirus, and vaccinia virus with the goal of enhancing therapy. While the protocol has been tested for use with oncolytic Maraba virus and oncolytic vaccinia virus, this approach is applicable to other oncolytic viruses and can also be utilized for identifying host targets that modulate virus replication in mammalian cells in general. This protocol describes the development and validation of an assay for high-throughput RNAi screening in mammalian cells, the key considerations and preparation steps important for conducting a primary high-throughput RNAi screen, and a step-by-step guide for conducting a primary high-throughput RNAi screen; in addition, it broadly outlines the methods for conducting secondary screen validation and tertiary validation studies. The benefit of high-throughput RNAi screening is that it allows one to catalogue, in an extensive and unbiased fashion, host factors that modulate any aspect of virus replication for which one can develop an in vitro assay such as infectivity, burst size, and cytotoxicity. It has the power to uncover biotherapeutic targets unforeseen based on current knowledge. High-throughput genome-wide RNAi screening has proven to be an invaluable tool for revealing biological insights in diverse areas of study including virus biology. Over the past decade or so, numerous groups have undertaken cell-based large-scale RNAi screening to extensively identify host genes that modulate virus replication (Reviewed in1,2,3,4,5,6,7). Interestingly, a large number of these screens have been conducted in cancer cells and several with viruses that are current oncolytic virus candidates including vaccinia virus8,9,10, Myxoma virus11, herpes simplex virus12, vesicular stomatitis virus13,14, and Maraba virus15. While the focus of the majority of these studies was on identifying host factors that influence some aspect of virus replication and not on identifying biotherapeutic targets for enhancing oncolytic virus therapy, valuable data could be mined from these data sets in this regard. It is clear that the powerful potential to identify host targets that can be manipulated to enhance oncolytic virus therapy has not been fully exploited. A plethora of oncolytic virus platforms are currently being tested in preclinical and clinical studies including herpes simplex virus, reovirus and vaccinia virus, which have had demonstrable success in late-stage clinical trials. For the majority of these platforms, efforts have been directed toward altering the virus genomes to enhance therapy. For instance, to increase tumor specificity, specific virus genes have been deleted or mutated to significantly restrict viral replication in normal cells, but not in tumor cells. In some cases, transgenes have been added like GM-CSF (granulocyte macrophage colony-stimulating factor) to potentiate the immune response or NIS (sodium iodide symporter) to enable in vivo imaging and cellular radioiodide uptake for therapeutic purposes. However, there has been very little work focused on manipulating host/tumor genes and exploring the impact of host/tumor genes on oncolytic virus replication. With the advent of high-throughput screening technology, it is now possible to probe host-virus interactions on a genome scale and to decipher opportunities to manipulate the host genome to enhance oncolytic virus therapy (Reviewed in16,17,18). We reported the first study demonstrating proof-of-concept for using high-throughput genetic screening to identify host targets that could be manipulated to enhance oncolytic virus therapy. To discover host genes that modulate Maraba virus oncolysis, an oncolytic rhabdovirus currently being tested in phase I and II trials, we conducted genome-wide RNAi screens across three different tumor cell lines in duplicate with an siRNA (short interfering RNA) library targeting 18,120 genes15. Pathway analysis of hits identified in the screens revealed enrichment of members of the ER (endoplasmic reticulum) stress response pathways. We selected 10 hits within these pathways for secondary validation using siRNA with different targeting sequences from those of the primary screen. As part of tertiary validation, we conducted a rescue experiment with IRE1α (inositol-requiring enzyme 1 alpha) to confirm that the hit was on target. In vitro and in vivo testing using a small molecule inhibitor of IRE1α resulted in dramatically enhanced oncolytic efficacy. Workenhe et al.12 also conducted a genome-wide RNAi screen using a pooled lentiviral shRNA (short hairpin RNA) library targeting 16,056 genes to identify host factors restricting the human herpes simplex virus type 1 (HSV-1) mutant KM100-mediated oncolysis of breast cancer cells. In the primary screen, they identified 343 genes the knockdown of which lead to enhanced cytotoxicity of KM100-infected cells over mock-infected cells; they selected 24 of these genes for secondary validation. Out of the 24 genes, 8 genes were confirmed in the secondary screen with one of them being SRSF2 (serine/arginine-rich splicing factor 2) which was subsequently confirmed using a genetic rescue experiment during tertiary validation. The group went on to identify a DNA topoisomerase inhibitor chemotherapeutic that reduced the phosphorylation of SRSF2 and showed that the combination treatment of HSV-1 KM100 with this inhibitor lead to extended survival of TUBO tumor-bearing mice. In the aforementioned studies, a similar workflow was followed. Each began with a primary genome-wide RNAi screen followed by a secondary screen on a select number of hits identified in the primary screen. This was followed by tertiary validation studies, which included confirming that the hit was on-target by performing genetic rescue experiments in vitro with ultimate validation performed by manipulating the target gene product in vivo. In this article, we first provide a general protocol for the development and validation of a high-throughput siRNA-screening assay, which involves determining the optimal transfection conditions, amount of virus, and length of infection. We also offer a detailed protocol for conducting a primary a high-throughput siRNA screen as well as an overall description of the method for performing secondary screen validation and tertiary validation. NOTE: For all experiments, use Hepes-buffered growth media appropriate for each cell line. See Figure 1 for an overview of the workflow from assay optimization to tertiary validation. Select a tumor cell line or ideally multiple tumor cells lines with which to optimize transfection conditions (e.g. 786-O, NCI-H226, SF268, U373, OVCAR-8, U20S; see Discussion for more on the selection of cell lines). Select a transfection reagent or several to test. It may be necessary to test several transfection reagents, as some may be more toxic or efficient than others in a given cell line. Also, keep in mind that some may impact on virus infection or may generate high background signal upon imaging. Decide on positive [e.g. siRNA targeting PLK-1(Polo Like Kinase 1) mRNA, which induces cell death] and negative transfection controls (e.g. non-targeting siRNA). Follow the reverse transfection protocol for the particular transfection reagent, but vary the amount of transfection reagent (e.g. 0.05, 0.1, 0.15 and 0.2 μL/well) and cell seeding densities (e.g. 625, 1250, 2500 cells/well). Include replicates of the following conditions: untreated cells, mock transfected cells (i.e. cells plus transfection reagent), and cells transfected with positive and negative transfection control siRNA (see Figure 2A for a sample plate layout). In general, prepare 80 nM dilutions of each siRNA for a final concentration in the well of 10 nM (depending on the library, a higher concentration of siRNA may be required). Unless otherwise specified, dilute the siRNA with the transfection reagent diluent. Prepare dilutions of the transfection reagent. Pipet 5 μL of siRNA per well followed by 5 μL of diluted transfection reagent. To facilitate this step, distribute along a column of a U-bottom 96-well plate, the siRNA mixes and the siRNA diluent alone (for untreated and mock transfected cells). Distribute along a second column, the diluted transfection reagent and transfection reagent diluent alone (for untreated cells). Using an electronic pipet, pipet 5 μL/well of the contents of the first column containing siRNA or siRNA diluent into the corresponding wells of the 384-well plate followed by 5 μL/well of the diluted transfection reagent or transfection reagent diluent from the second column. Centrifuge the plates at 1026 x g for 1 min at room temperature, and incubate for the time prescribed for the transfection reagent (e.g. 5-20 min). While the plates are incubating, prepare cell suspensions of different densities. Pipet 30 μL of cell suspension per well. Before placing the plates in the incubator, let the plates sit for 45-60 min at room temperature to allow for the uniform settling of cells19. Note: If the incubation period prescribed for the transfection reagent with siRNA is short, prepare the cell suspensions before the incubation. Incubate for 48 to 72 h depending on the desired length of knockdown chosen for the screen. Prepare a fixing and staining solution consisting of formaldehyde, Hoechst 33342 and PBS (phosphate-buffered saline) for a final concentration in each well of 4% formaldehyde and 5 ug/mL of Hoechst 33342. As needed, try a higher (e.g. 7.5 ug/mL) or lower concentration (e.g. 2 ug/mL) of Hoechst if the signal is too weak or too strong, respectively. Dispense 30 μL of the fixing and staining solution directly into all wells. Incubate the plates for 30 min at 37 °C. Store the plates at 4 °C. If using a non-confocal microscope, wash the plates with PBS using a plate washer; in most cases, washing is unnecessary when using a confocal microscope. Develop a script to quantify the number of cells per well. NOTE: There are several software suites available for this purpose and, while each may have different ways of generating scripts, they all generally have a means of identifying nuclei, cells and regions of interest as well as calculating intensities and morphological properties. When developing a screening script, it is important to consider the time required to run the script per plate and to perhaps include only essential measurements to minimize processing time. For example, to quantify cell number, one might calculate the Hoechst area per well above a specified intensity; and to quantify virus spread, one might calculate the GFP (green fluorescent protein) area per well above a specified intensity. The "pared down" script will need to be compared to the more elaborate script to ensure no essential information is lost. Analyze the results to determine the optimal transfection conditions, that is the transfection reagent amount and the cell seeding density that results in significant cell death (0-30% cell survival) and is minimally toxic to the cells (e.g. 90-100% cell survival). Note: It may take longer to observe the cell death phenotype in cell lines with long doubling times. See Figure 2B and 2C for representative results. Also, ensure that the cells transfected with non-targeting siRNA are approximately 90-100% confluent at the time of fixation as later on one will want to infect cells that are of this confluency. Perform the same reverse transfection steps as described above (see 1.1.4.1 to 1.1.4.4); however, use only the optimal transfection conditions (see 1.1.8) (e.g. for 786-O cells: 1500 cells/well and 0.05 μL/well of RNAiMAX) and, in addition, include extra wells to be infected with virus [e.g. wells with untreated cells, mock transfected cells, cells transfected with non-targeting siRNA, and cells transfected with positive virus controls if ones are known (i.e. siRNA targeting host genes that will inhibit or enhance replication)]. See Figure 3A for a sample plate layout. Incubate for 48-72 h.
Infect the additional virus wells with an oncolytic virus expressing a fluorescent reporter protein (e.g. GFP) with a range of multiplicities of infection (MOIs) (e.g. 0.001 to 10; The range chosen will be depend on the level of resistance or susceptibility of the cell line.). Include uninfected wells as well. Pipet 40 μL of each virus dilution per well for a final volume of 80 μL. Centrifuge each plate at 400 x g for 30 min at room temperature. Following infection, image the cells live with a high-content, automated microscope at regular intervals (e.g. every 4-8 h). See Figure 3B and 3C. Develop a script to quantify virus spread (e.g. GFP area per well) (see 1.1.7). Analyze the images and select a time-point and an MOI that allow for the detection of increases and decreases in spread. Ensure the time-point and MOI fall within a linear range to facilitate detection of small changes in spread. Estimate the Z-factor (or Z') for the given time-point and MOI. NOTE: Estimated Z-factor = 1 - 3(σp + σn)/|μp-μn|, where σp is the sample standard deviation of the positive virus controls and σn is the sample standard deviation of the negative virus controls; and μp is the sample mean of the positive virus controls and μn the sample mean of the negative controls. An estimated Z-factor of 0.5 - 1.0 is considered to be an excellent assay and suitable for screening20,21. Confirm that the negative virus control siRNA has no impact on virus replication by comparing it to the mock transfected and untreated wells. It is often necessary to test multiple negative controls as some negative siRNA controls can impact on virus replication. Repeat steps 1.2.1 and 1.2.2 above, but only this time infect cells with the optimal MOI. Instead of live imaging, fix and stain the plate (as described in 1.1.5 and 1.1.6) at the optimal time-point (see 1.2.4). Image the plate. Analyze the results using the same script that will be used for the screen (see 1.1.7 and 1.2.4). Confirm the transfection conditions (i.e. good knockdown in wells transfected with positive transfection control and minimal toxicity in wells transfected with negative transfection control). Estimate the Z-factor to determine the robustness of the assay (see 1.2.4). Test the durability of the microtiter plates as some plates may crack during centrifugation, especially when the lids are kept on and multiple plates are centrifuged at once. To reduce cracking, centrifuge without the lids (provided the plates have seals), or decrease the number of plates centrifuged per bucket. Test the stability of the transfection reagent mix over time. Once the transfection reagent is added to the plates, there may be a significant delay before the addition of cells; therefore, it is important to know the period of time for which the transfection reagent mix will remain effective. For the screen, it may be necessary to prepare cells in advance of adding the transfection reagent mix to the plates. Prepare for using the liquid dispenser. Determine the volumes required to dispense transfection reagent, cells, virus, and fix taking into account the volume that the tubing holds, the volume lost to pre-dispensing (if the unit has this feature), and the residual volume required in the bottles used for dispensing. Set and test the programs that will be used for dispensing transfection reagent, cells, and virus. To minimize the loss of transfection reagent, limit, if possible, the number of pre-dispenses. Establish a protocol for calibrating the liquid dispenser and testing its accuracy and precision. First determine the number of plates to be processed in one batch considering the number of plates of cells that can feasibly be trypsinized at once, the number of microtiter plates that can be centrifuged at once, the length of time required to process one batch of plates with the liquid dispenser, and also the time required for imaging. Note: Generally, processing approximately 30 plates at a time is quite feasible and processing 3 batches of plates is manageable in one day. Empirically verify the volume of transfection reagent required to process one batch of plates. Test that this volume is adequate by dispensing 5 μL of distilled water multiple times across one plate the equivalent number of times that will be required to process one batch. To ensure the even distribution of cells, estimate the time necessary to dispense cells across one batch of plates. Prepare a bottle containing the volume of cells required for a batch, and dispense the cells into multiple columns of a plate at a time, at regular intervals over the same course of time it will take to dispense across a batch of plates. Test how often it will be necessary to mix the cells to maintain an even distribution of cells. To ensure the even distribution of virus, repeat the same procedure as above (see 1.4.4.3), but this time dispensing virus onto confluent wells. If the virus is not evenly distributed, consider preparing the virus in conical tubes and vortexing each tube prior to dispensing. Track the growth of cells to determine the timeline for growing enough cells for the screen. Also, determine the average number of cells that can be harvested per plate of cells growing in log phase in order to be able to estimate the number required for the screen. Up to one month prior to commencing screening, determine all of the materials necessary for the screen. Order any required reagents (see Materials). Ensure the required amount of virus is on hand (Preferably, use the same stock that was used during optimization.). Up to two weeks prior to commencing screening, thaw and grow up the cells required for the screen. Ensure the availability of the centrifuge and square centrifuge buckets. During the week prior to commencing screening, prepare media bottles for the reverse transfection and infection, a stock of 70% ethanol, 2X transfection reagent diluent (e.g. 2X Opti-MEM), if necessary (e.g. if the siRNA library is diluted in RNase-free water, one will want to use 2X to transfect cells), and aliquots of virus (one per batch of plates). Verify the condition of the cells. Prepare a stock solution of Hoechst 33342 stain (e.g. 5 mg/mL). Prepare a balance plate if one will be required for centrifuging. Ensure the plate washer is in good working order if it will be used. Ensure the liquid dispenser is properly calibrated and dispensing accurately and precisely. Also, ensure the programs are properly set on the liquid dispenser. NOTE: Prior to commencing the RNAi screen, microtiter plates (e.g. 384-well plates) need to be arrayed with the siRNA library and screening controls. The following steps are best conducted by two persons with one person (i.e. Person A) being primarily responsible for dispensing the transfection reagent and cells across the plates, and the second person (i.e. Person B) being responsible for centrifuging the plates immediately prior to transfection and for preparing the cells. Included in parentheses are some specifics for processing one batch of 33 plates (i.e. half of the library) with the 786-O cell line. Person A: Place enough media, trypsin and PBS necessary to process one batch of plates in a 37 °C water bath. Optional: Trypsinize a plate of cells, and count the number of cells per plate in order to provide a real-time estimate of the number of plates required per batch. Obtain a batch of plates (e.g. 33 plates) from the freezer and wait 20-30 min to allow the plates to defrost. While the plates are defrosting, continue with the following steps. Person A: Pipet into 50 mL conical tubes the amount of transfection reagent diluent necessary for processing one batch of plates (e.g. 2 x 37.125 mL) and place them in a 37 °C water bath. Fill two bottles with 70% ethanol (e.g. 250-500 mL bottles). Fill two 50 mL conical tubes with PBS and one with distilled water. Person A: Immerse the liquid dispenser tubing into a bottle of 70% ethanol. If all of the tips will not be used for dispensing the transfection reagent (e.g. if the outer wells of the plate are not being used), detach the unnecessary tubing first. Place a piece of masking tape around the tubing to mark the point below which the tubing can be considered sterile. Prime with approximately 25 mL. Pour additional ethanol into the bottle to replace the lost volume. Let the tubing sit in ethanol for a minimum of 5 min. Person B: Prepare to trypsinize cells. Spray the tissue culture (TC) hood with 70% ethanol. Spray and place the necessary pipets, tips, bottles and microfuge tubes for preparing cells in the hood (see 2.2.1.1 and 2.2.1.2). Centrifuge the sealed plates in sets at 1026 x g for 2 min at room temperature. Remove the lids from the plates in a TC hood, if previously determined that the plates might crack during centrifugation when the lids are kept on (see 1.4.1). Person A: Remove the seals from the plates. Before, during or after the seals have been removed (depending on the length of incubation required), pipet the required amount of transfection reagent (e.g. 375 μL/tube for a final concentration of 0.05 μl of RNAiMAX/well) into the conical tubes containing the pre-warmed transfection reagent diluent (e.g. 37.125 mL/tube). Mix by pipetting up and down 10 times. Incubate at room temperature for the time prescribed for the transfection reagent being used (e.g. 0-10 min). Have Person B complete the following tasks. Begin trypsinizing the cells (e.g. 3 plates of 786-O cells). Aspirate the media from each plate. Rinse with 9 mL of PBS. Pipet 3 mL of trypsin per plate. Incubate at 37 °C for approximately 5 min. Resuspend the cells with 22 mL of media. Pipet up and down 10 times. Combine the cell suspension from each tissue culture plate into a sterile bottle. Mix the cell suspension by inverting. Pipet 1 mL aliquots of the cell suspension into two separate microfuge tubes. Remove a sample from each microfuge tube and count the cells. Calculate the volume of cell suspension required for the density required (e.g. 1500 cells/well), and prepare enough diluted cell suspension (e.g. 500 mL) to dispense across one batch of plates. Have Person A complete the following tasks in parallel to Person B. Empty the liquid dispenser tubing of ethanol. Prime the tubing with approximately 25 mL of PBS, and then empty the tubing. Be careful when handling the tubing to ensure that the section of tubing below the masking tape that will be immersed in transfection reagent and later in the cell suspension is kept sterile.Set apart plates that can safely be done with one conical tube of transfection reagent solution. Pipet the transfection reagent solutions up and down 10 times. Prime the tubing with the transfection reagent solution. To minimize the loss of transfection reagent, prime with just enough solution to barely clear the tips. Select the correct program on the liquid dispenser and dispense 5 μl of transfection reagent per well. CAUTION: Closely monitor the level of the transfection reagent so that it is replenished before it runs out. The completion of the plates that are set apart should provide a cue to add more transfection reagent solution. Centrifuge the plates at 1026 x g for 1 min at room temperature. This time the lids will be on, so it may be necessary to centrifuge less plates at a time to prevent cracking (e.g. 2 plates per bucket). Incubate the plates at room temperature for the time prescribed for the transfection reagent being used (e.g. 10-20 min). During the incubation, empty the tubing of the transfection reagent solution, and place it into a full 50 mL conical tube containing PBS. Rinse the tubing with approximately 25 mL of PBS by priming and emptying. If more of the tips are going to be used for dispensing cells than were used for dispensing transfection reagent, re-attach the unused tubing, and re-sterilize all the tubing with 70% ethanol before rinsing the tubing with PBS (see 2.1.2.2). Mix the bottle containing the cell suspension once it has been prepared. Place the tubing in the cell suspension, and prime enough to see that each tip is dispensing properly. Dispense 30 μL per well of the cell suspension across all the plates. If necessary, mix the cell suspension at regular intervals to avoid settling. CAUTION: Sometimes droplets of suspension containing media may stick to the sides of the tips. When this is observed, aspirate as soon as possible or wipe with lint-free tissue doused in 70% ethanol. Empty the tubing of the cell suspension. Rinse the tubing with approximately 25 mL of PBS, followed by approximately 50 mL of distilled water. Allow the plates to sit for 45-60 min from the time of cell seeding at room temperature before returning the plates to the incubator. Incubate the plates in an undisturbed incubator for the desired length of gene silencing (e.g. 48 h) (see 1.1.4.5). To save time, the day prior to infecting the cells, pipet into sterile bottles the precise amount of media required to infect each batch of plates including media for uninfected wells (e.g. 2 x 350 mL and 2 x 50 mL for 33 plates). In addition, test the liquid dispenser for precision and accuracy, and re-calibrate if necessary. Warm the media at 37 °C. Fill two bottles with 70% ethanol, two 50 mL conical tubes with PBS and one with distilled water. Verify that the centrifuge is at room temperature. Sterilize the tubing with 70% ethanol, and rinse with PBS as previously described (see 2.1.2.2 and 2.2.2.1).While the tubing is sitting in the ethanol, pipet the precise volume of virus required into the bottle containing the media previously prepared for infection (see 2.3.1).Rinse the tubing with PBS by priming with 25 mL and then emptying. After mixing the virus, place the tubing into the bottle containing the virus. Dispense 40 μl of virus across the plates. Centrifuge the plates for 30 min at 400 x g at room temperature. Return the plates to the incubator. Incubate the plates for the previously determined length of time (e.g. 24 h) (see 1.2.4). To save time, the day prior to fixing, prepare a bottle of fixing and staining solution containing formaldehyde and PBS (e.g. 179 mL of 37% formaldehyde and 270 mL of PBS for a final concentration of 4% formaldehyde) for each batch of plates, but omit the Hoechst stain. Store in the flammable cabinet away from light. Rinse the tubing with 70% ethanol and PBS as previously described (see 2.1.2.2 and 2.2.2.1). Add the required volume of Hoechst (e.g. 2.5 mL of a 5 mg/mL of Hoechst for a final concentration in the well of 7.5 μg/mL) to the fixing and staining solution and mix. Dispense 30 μL of fixing and staining solution across all the plates. Place the plates in the incubator for 30 min. Following incubation, apply the seals to the plates, and store the plates at 4°C protected from light. Wash the plates if necessary (see 1.1.6). Image the plates with an automated, high-content microscope. Use the previously determined settings, but first test the settings to ensure no adjustments need to be made. Quantify the GFP (or other fluorescent reporter) area and Hoechst area per well using the previously developed script (see 1.3.2 ). Test the script with a handful of plates first to determine if any slight modifications need to be made before batch analyzing all of the plates. Identify hits. Note: The robust Z-score/MAD (median absolute deviation) method is a method that is often used towards this end. Typically, scores of >2 or <-2 are set as cut-offs. This method is best used when the siRNA samples are randomly distributed across the plates and not, for example, grouped by function as the samples are used as de facto negative controls. Filter out cytotoxic siRNAS as these would be expected to non-specifically decrease virus spread (see Discussion for further details on filtering out cytotoxic hits). NOTE: See Discussion for details on selecting hits for secondary validation and possible screening technologies. If siRNA technology is selected for secondary validation, the same assay development and validation protocol can be used as was used for the primary screen (see 1). Obtain a custom TRC shRNA library targeting the candidate genes of interest as glycerol stocks. Prepare transfection quality plasmid DNA from the glycerol stocks. Note: A detailed protocol (i.e. "shRNA/sgRNA/ORF Glycerol and Plasmid DNA Preparation") can be found here: http://portals.broadinstitute.org/gpp/public/resources/protocols. Produce lentiviruses expressing shRNA targeting the genes of interest with the DNA plasmids. Note: A detailed protocol for lentivirus production in 96-well plates [i.e. 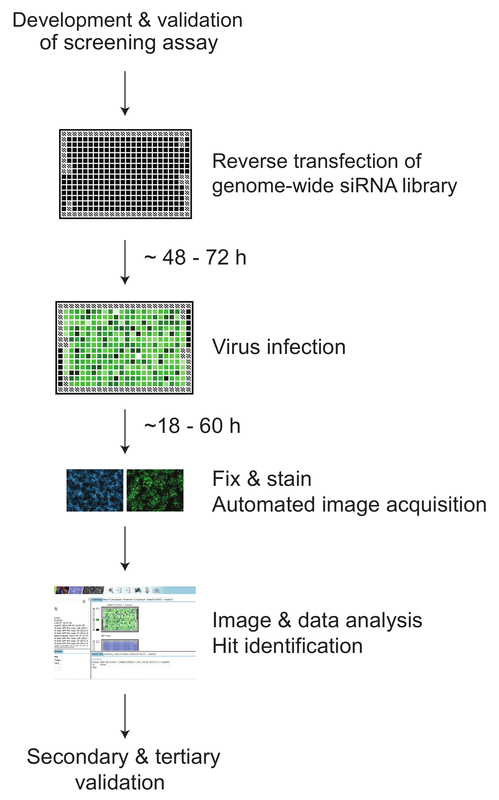 "shRNA/sgRNA/ORF High Throughput Viral Production (96 well)"] can be found here: http://portals.broadinstitute.org/gpp/public/resources/protocols. Infect cells with the lentiviruses. Note: A detailed protocol for lentiviral infection in 96-well plates (i.e. "Lentiviral Infection") is available online at http://portals.broadinstitute.org/gpp/public/dir/download?dirpath=protocols/production&filename=TRC%20viral%20infection%20200909.pdf. Infect cells with oncolytic virus either following puromycin selection (see 3.4 for the selection protocol) of successfully transduced cells or immediately following transduction (without puromycin selection). To determine the optimal amount of virus and the length of incubation with virus, use the same method used for the primary screen. First confirm that there is a correlation between the phenotype and gene silencing. Use the same assay that was developed for the screen or modify it for a 6-well format to assess the enhancement or inhibition of spread in a larger format. Conduct a time-course with cells transfected with siRNA targeting the gene(s) of interest plus and minus virus. Image the wells containing virus-infected cells, and collect the cell lysates from the uninfected wells at regular time intervals. Determine whether there is a correlation between gene silencing and enhancement or inhibition of spread. Assess gene silencing by Quantitative Polymerase Chain Reaction (qPCR) and/or Western blotting. Perform a genetic rescue experiment to confirm the hit is on-target. Note: In a typical rescue experiment, the candidate gene is knocked-down with RNAi while at the same time cells are transfected transiently with RNAi resistant cDNA (e.g. ortholog of the gene) expressing the candidate gene to determine whether the phenotype of the gene is restored or "rescued." Stable cell lines overexpressing RNAi resistant cDNA of the candidate gene of interest can also be employed. Alternatively, instead of a genetic rescue experiment, use multiple orthogonal assays to confirm that the hit is on-target [e.g. determine whether the same phenotype is obtained upon knockdown of the target gene with multiple siRNAs, upon knockdown of the target gene in multiple stable cell lines expressing shRNA against the target gene, and upon knockout with CRISPR (Clustered regularly interspaced short palindromic repeat)-Cas9 technology in multiple cell lines.]. Conduct a similar assay as in 4.1.1, but with normal cells as well as with other tumor cell lines. NOTE: Described below are three possible methods for manipulating the gene target in vivo. Find a drug to manipulate the gene target. If there is a drug such as a small molecule inhibitor that targets the same gene, administer it with the oncolytic virus in vivo. It is important to determine the optimal timing for administering the drug. Engineer the virus to inhibit or overexpress the gene target depending on whether one desires to inhibit or enhance the gene target. To inhibit the gene, engineer the oncolytic virus to express a dominant negative of the gene or to express shRNA targeting the gene. To enhance the expression of the gene target, clone the oncolytic virus with a transgene overexpressing the gene. Engineer cell lines with the gene knocked-down or knocked-out using shRNA or CRISPR-Cas9 technology, respectively. Implant the engineered cell line and the wild-type cell line in vivo and subsequently infect with the oncolytic virus. Note: This method serves as a proof-of-principle and can help determine whether investing additional time and resources to develop a drug to manipulate the gene in vivo, for example, would be worthwhile. An overview of the workflow for identifying host targets to enhance oncolytic virus therapy is presented in Figure 1. As illustrated in Figure 1, the critical first step to conducting a high-throughput RNAi screen is assay development. Figure 2A provides a sample plate layout for the transfection optimization assay. Figure 2B consists of representative images of expected results, and Figure 2C is a representative plot of the expected results. Following siRNA knockdown of PLK-1, a gene that induces cell death and can be used as a positive control to monitor siRNA knockdown efficiency, one would expect the cell survival to be between 0-30%, unless the cell line has a long doubling time in which case it will take longer to observe the cell death phenotype. The non-targeting siRNA should also be minimally toxic to the cells with a similar relative survival to that of untreated cells. Another key element of assay development is to determine the MOI at which to infect the cells and the length of time for infection. Figure 3A provides a sample plate layout for determining the amount of virus and the length of incubation with virus. Figure 3B depicts the results of a live time-course of 786-O cells infected with vvDD-eGFP (oncolytic vaccinia virus expressing enhanced GFP with the Thymidine Kinase and Vaccinia Growth Factor genes deleted) at various MOIs. Representative images of cells infected with vvDD-eGFP at an MOI of 0.05 are shown in Figure 3C. Based on the results plotted in Figure 3B, one might select an MOI of 0.05 and a length of infection of 21 h as this would allow for the detection of increases and decreases in spread as this time-point is within a linear range, and the estimated Z-factor at this time-point is 0.6 for cohorts that increase and for cohorts that decrease spread. As part of validating this assay, one will want to fix the cells at this MOI and time-point, and calculate the Z-factor. Following the protocol described, we conducted genome-wide RNAi screens across three different tumor cell lines (e.g. OVCAR-8, U373, NCI-H226) in duplicate with an siRNA library targeting 18,120 genes15. Using the MAD method, we identified 1008 hits common to at least 2 out of the 3 cancer cell lines (Figure 4A). Pathway analysis of hits identified in the screens revealed enrichment of members of the UPR (unfolded protein response) and ERAD (Endoplasmic-reticulum-associated protein degradation) pathways (Figure 4A). We selected 10 hits within these pathways for secondary validation using siRNA with different targeting sequences from those of the primary screen (Figure 4B). As part of tertiary validation, we conducted a genetic rescue experiment with IRE1α and ATF6α (activating transcription factor 6 alpha) to confirm that these hits were on target (Figure 4C). Figure 1: Schematic of workflow for identifying host targets to enhance oncolytic virus therapy. The first step is to develop and validate an assay for high-throughput RNAi screening, which includes optimizing transfection conditions for introducing siRNA into cells, determining the optimal amount of virus (i.e. MOI) to infect the cells with and the length of incubation with virus. The second step is to conduct a high-throughput genome-wide screen. An siRNA library targeting genes across the entire genome is arrayed on microtiter plates. Cells are then reverse transfected with the siRNA library. Following a 48-72 h incubation period to allow for gene silencing, cells are infected with the optimal amount of virus. After the optimal length of incubation with virus, cells are fixed and stained, and subsequently imaged with a high-content microscope. Subsequent image and data analysis will help to identify genes that significantly modulate virus replication, which are referred to as "hits." A secondary validation screen is performed on select hits from the primary screen generally using siRNA or shRNA with different seed regions. Tertiary validation experiments are performed to confirm that the hits are on-target, tumor specific and enhance efficacy in vivo. Please click here to view a larger version of this figure. Figure 2: Optimization of transfection conditions for high-throughput RNAi screening assay. (A) A sample plate layout for optimizing transfection conditions with two different cell lines. (B) Representative images of 786-O cells (1500 cells/well) stained with Hoechst 33342 following 72 h incubation with transfection reagent diluent alone (i.e. untreated), with transfection reagent and diluent (i.e. mock transfected), with non-targeting siRNA and with siRNA targeting PLK-1. (C) Representative results from transfection optimization experiment showing 22% survival of cells transfected with PLK-1 siRNA (n=24) and 94% survival of cells transfected with non-targeting siRNA (n=8). Error bars = ± SD, standard deviation; scale bars = 200 μm. Please click here to view a larger version of this figure. Figure 3: Determination of the amount of virus and length of incubation with virus for high-throughput RNAi screening assay. (A) A sample plate layout for optimizing the amount of virus and length of incubation with virus. Columns 1 and 24 contain transfection controls and are left uninfected. Columns 2 to 23 contain untreated cells, mock transfected cells and cells transfected with positive and negative virus controls all infected with a range of MOIs starting with no virus in columns 2 and 3. (B) 786-O cells were reverse transfected with non-targeting siRNA and incubated for 48 h. They were subsequently infected with vvDD-GFP at the MOIs indicated and imaged at 8 h intervals starting at 5 hours post-infection (hpi). The mean GFP area per well (± SD) was calculated for each time-point (n=12) and plotted on the graph. The Z-factor calculated between points A and B is 0.6 and the Z-factor calculated between points B and C is 0.6. (C) Representative live images of a well infected with an MOI of 0.05 at the time-points indicated. Magnification, 10x; 9 fields/well; scale bars = 200 μm. Please click here to view a larger version of this figure. Figure 4: Genome-wide Screen Identifies ER Stress Response Blockade as a Potent Sensitizer of Rhabdovirus-Mediated Oncolysis. (A) Venn diagram outlining the number of overlapping hits of high-throughput RNAi screens in 3 tumor cell lines, and a table (+, synthetic lethal; -, no interaction) and schematic diagram (hits outlined in red) illustrating key hits within the UPR and ERAD pathways. (B) EC50 shifts (black bars, left y axis) were determined for U373 cells treated with Maraba virus (48 h) following treatment with siRNA (72 h) targeting a series of UPR/ERAD hits from the screen. Relative mRNA expression for each gene following siRNA knockdown (72 h) is depicted in white (right y axis). (C) Cell viability assays were conducted 48 h after Maraba virus infection, in U373 cells ectopically expressing mouse ATF6α (or control GFP) ± siRNA targeting human ATF6α (or non-targeting [NT] control; left panel) or human XBP1(s) (or control) ± siRNA targeting human IRE1α (or control; right panel). Western blots demonstrating gene silencing and ectopic gene expression are shown. EC50 shifts = the shift in the dose of virus required to kill 50% of the cells; Error bars = ±SD; XBP1(s) = X-box binding protein 1 (spliced); In (B), one-way ANOVAs were performed followed by a Bonferroni multiple comparison's post hoc test to derive p values; In (C), student's t-tests were performed to derive p values; *p < 0.05; #p < 0.05. (This figure has been modified from Mahoney et al., 201115). Please click here to view a larger version of this figure. Here we present a protocol for employing high-throughput RNAi screening to identify host targets that can be manipulated to enhance oncolytic virus therapy. This has been tested successfully with oncolytic Maraba virus and oncolytic vaccinia virus, but, as noted, it can be adapted for use with other oncolytic viruses or other viruses generally to identify host genes that modulate virus replication. The screening protocol is also designed to identify genes that increase or decrease spread, but it can be readily modified for other readouts. Our screens with Maraba virus, for instance, were designed to identify genes modulating oncolysis utilizing a simple resazurin-based vital dye assay to score cell viability (see Figure 4)15. In these screens, following incubation with virus, instead of fixing cells with formaldehyde and staining with Hoechst, we dispensed resazurin dye into each well (final concentration of 20 μg/mL) and, after a 6 h incubation, we measured absorbance (573 nm) with a plate reader. We could have also used cell number based on Hoechst staining as a readout. While using a surrogate reporter to monitor virus replication was unnecessary in this screen, a virus with a reporter protein, particular a fluorescent protein does facilitate screen optimization as one can, for example, monitor virus replication live; furthermore, a virus with a reporter protein is less cumbersome and costly than using antibodies to stain for viral antigens, but it is possible to screen without one. In addition, one could make even further modifications to the assay to investigate host factors that impact on infectivity, burst size, and even more detailed sub-phenotypes like immunological cell death. In each case, one would follow a similar assay development protocol, screening strategy and secondary and tertiary validation methods. In the protocol, we suggest optimizing transfection conditions ideally with multiple tumor cell lines. There are at least two reasons for optimizing with multiple cell lines. One reason is that not every cell line is amenable to high-throughput screening as some may be difficult to transfect or may not adhere well, but a key reason is to enable screening with multiple cell lines in order to avoid cell intrinsic bias. The choice of cell lines is largely dependent on one's objectives. One may elect to focus on a particular cancer type or select disparate cancer types to cover a broader spectrum. Alternatively, one may wish to focus on tumor cell lines that are resistant to identify host factors that can be manipulated to make the tumor cell lines less resistant to oncolytic virus infection. In addition to the selection of cells lines, the selection of positive and negative virus controls is an important consideration for any screen. In some instances, virus genes that are required for or restrict replication may not be known or, if they are known, they may be cell-specific. Consequently, one can still determine the approximate robustness and dynamic range of the assay by using surrogate controls. For example, one could use uninfected cells or cells infected with a low MOI as a surrogate positive control for identifying genes that decrease spread upon knockdown. For identifying genes that enhance spread upon knockdown, one could infect cells with a dilution series of virus, and use wells with the maximum signal as a surrogate positive control. Selection of hits for secondary screen validation and the type of technology to employ is another matter that requires careful deliberation. Candidates are generally selected for secondary screen validation based on the magnitude of the hit, on whether they significantly modulate spread in multiple cancer cell lines (if primary screens were conducted in multiple cell lines) and on biological interest. Bioinformatics tools such as DAVID22,23, PANTHER24, STRING25 and PINdb26 can help to isolate pathways and hits of biological interest. Mercer et al.8 describe the use of open-source image analysis software and have also made available an algorithm that they developed for the visualization and analysis of hits. One factor to take into account when interpreting results is that gene silencing may have different impacts depending on the stage in the virus life cycle that is being investigated. For example, it is possible that knockdown of a gene early in the life cycle may inhibit virus replication, while knockdown at a later stage may increase replication. Often, secondary screens are conducted with siRNA from a different vendor with different seed regions with multiple siRNAs per gene. However, complementary technologies targeting candidate genes can be employed such as CRISPR-Cas9 or lentivirus vectors expressing shRNA. The method of analysis is also a critical consideration. We suggest here using the robust Z-score or MAD20,27 with suggested cut-offs for hit calling of >2 or <-2. The cut-offs can be increased or decreased depending on whether the focus is on eliminating more false positives or capturing more false negatives. For instance, in a recent high-throughput screen with vaccinia virus9, the lower cut-off was set at -1.5 (no upper cut-offs were described as the focus was on identifying genes that decreased spread upon knockdown). There are also other methods that can be employed including the z-score, SSMD (strictly standardized mean difference), and the B score20,28,29,30. Barrows et al.31 compared hit lists generated by sum rank, MAD, z-score and SSMD and found each method of analysis resulted in different hit lists. In toto, there is no perfect method or cut-off. Ultimately, secondary screen validation and tertiary validation studies will confirm true hits. The method of filtering out cytotoxic hits must also be considered. One way is to conduct primary screens in parallel plus or minus virus. This permits the detection of siRNAs that are cytotoxic on their own. This was our approach in our Maraba virus screens15; however, this is not often practical. Perhaps a more practical method, in addition to being robust, is to ascertain hits that are cytotoxic as part of secondary screen validation, especially if one's focus is to identify hits that decrease replication upon knockdown. For instance, in a whole genome primary screen with Myxoma virus, Teferi et al.11 identified 1,588 siRNAs that decreased virus replication upon knockdown. To filter out cytotoxic siRNAs, they conducted a secondary cytotoxicity screen with these siRNAs; they measured cell viability 72 h post-transfection using a resazurin-based cell viability assay. Cytotoxic siRNAs were identified based on a Z-score of ≤ -1.96. Another approach is to simply filter out cytotoxic siRNAs from the primary screening data based on a reduction of cell number by a certain percentage, for example, by a reduction > 50% as in Sivan et al.9, or based on a particular score as in Lee et al.14; in their study of host factors required for vesicular stomatitis virus replication, they excluded siRNA hits that reduced cell viability by > 3.0 standard deviations from the mean. The mean number of cells was determined based on the Hoechst staining of cell nuclei and, although not explicitly stated, the mean was seemingly calculated on a per plate basis as it is clear that the mean GFP signal was calculated on a per plate basis. A limitation of any high-throughput RNAi screen is the frequent high number of false positives and negatives, which may come as a consequence of the assay design, the technology used or through systematic errors. For example, a protein may significantly affect the replication of the virus, but the time chosen for gene silencing may be too short given the protein's half-life to detect its effect leading to a false negative by virtue of the assay design. It is well established that incomplete knockdown and the off-target effects of siRNA technology can also introduce false positives and negatives. Systematic errors, such as the edge effect32, can generate misleading results as well. Here the signal in the outer wells of the plate may be systematically higher or lower than the rest of the plate due to evaporation. There are strategies to address some of these issues including, for instance: decreasing the concentration of siRNA to reduce off-target effects33, reconfiguring plate layouts to fill the outer wells with media to mitigate the edge effect, or employing computational methods that have been developed to detect and counter systematic errors such as the edge effect32,34,35. A general method to deal with false positives is to conduct a secondary screen following the primary screen. As a way of dealing with false negatives, one may relax the cut-off for hit calling, and include potential false negatives for secondary screening. This, of course, will not capture false negatives that are well below the cut-off. Primary screens should also be conducted in duplicate or triplicate to limit spurious results. Ultimately, no matter what strategies are employed, no high-throughput screen will exhaustively identify all true hits, but it can provide a treasure trove of data from which one is likely to mine some valuable hits that can be capitalized upon. In this protocol, we described the use of arrayed siRNA and shRNA technology, though another alternative is the use of pooled shRNA and CRISPR-Cas9 libraries. A pooled shRNA library was employed in the Workenhe et al.12 study outlined in the introduction. Pooled CRISPR-Cas9 technology has been used to conduct genome-scale screens to identify host factors required for replication of viruses such as Zika virus36, West Nile virus37,38, dengue virus39 and hepatitis C virus39. The advantage of using pooled libraries is that they are less expensive to purchase, do not require specialized infrastructure (e.g. liquid handling devices, high-content microscopes, and robotic equipment), nor do they have the high costs of operating and maintaining this infrastructure, and they require fewer consumables. The disadvantage is that the types of readouts are more limited. In most if not all pooled library host-virus interaction screens to date, the readout is cell viability or lack thereof; one cannot readily probe for more complex phenotypes. The choice of format depends on the biological question being asked. The advancements in genetic screening technology over the past several decades that first enabled screens in bacteria and yeast to now present-day genome-scale screens in human cells have opened the door wide for discovery in diverse fields of study. These genetic screens have not only allowed us to answer fundamental biology questions, but have given us keys to unlocking insights into developing and improving biotherapeutics. While there are still lessons to be learned and challenges to be overcome with this technology, the results to date have been exciting. The discoveries will likely be even greater as novel screening technology including CRISPR-Cas9 libraries, microfluidics and in vivo screening technologies continue to mature. This work was supported by grants from the Ontario Institute for Cancer Research, the Canada Foundation for Innovation, the Ottawa Regional Cancer Foundation, and the Terry Fox Research Institute. K.J.A. was supported by a Vanier Canada Graduate Scholarship, a Canadian Institute for Health Research-Master's Award, and an Ontario Graduate Scholarship. Cherry, S. What have RNAi screens taught us about viral-host interactions? Curr. Opin. Microbiol. 12, (4), 446-452 (2009). Panda, D., Cherry, S. Cell-based genomic screening: elucidating virus-host interactions. Curr. Opin. Virol. 2, (6), 784-792 (2012). Houzet, L., Jeang, K. T. Genome-wide screening using RNA interference to study host factors in viral replication and pathogenesis. Exp. Biol. Med. 236, (8), 962-967 (2011). Friedel, C. C., Haas, J. Virus-host interactomes and global models of virus-infected cells. Trends Microbiol. 19, (10), 501-508 (2011). Gao, S., Yang, C., et al. Applications of RNA interference high-throughput screening technology in cancer biology and virology. Protein Cell. 5, (11), 805-815 (2014). Kilcher, S., Mercer, J. Next generation approaches to study virus entry and infection. Curr. Opin. Virol. 4, 8-14 (2014). Ramage, H., Cherry, S. Virus-Host Interactions: From unbiased genetic screens to function. Annu. Rev. Virol. 2, (1), 497-524 (2015). Mercer, J., Snijder, B., et al. RNAi screening reveals proteasome- and Cullin3-dependent stages in vaccinia virus infection. Cell Rep. 2, (4), 1036-1047 (2012). Sivan, G., Martin, S. E., et al. Human genome-wide RNAi screen reveals a role for nuclear pore proteins in poxvirus morphogenesis. Proc. Natl. Acad. Sci. U.S.A. 110, (9), 3519-3524 (2013). Beard, P. M., Griffiths, S. J., et al. A loss of function analysis of host factors Influencing vaccinia virus replication by RNA Interference. PLoS ONE. 9, (6), e98431 (2014). Teferi, W. M., Dodd, K., Maranchuk, R., Favis, N., Evans, D. H. A whole-genome RNA interference screen for human cell factors affecting myxoma virus replication. J. Virol. 87, (8), 4623-4641 (2013). Workenhe, S. T., Ketela, T., Moffat, J., Cuddington, B. P., Mossman, K. L. Genome-wide lentiviral shRNA screen identifies serine/arginine-rich splicing factor 2 as a determinant of oncolytic virus activity in breast cancer cells. Oncogene. 35, (19), 2465-2477 (2015). Panda, D., Das, A., et al. RNAi screening reveals requirement for host cell secretory pathway in infection by diverse families of negative-strand RNA viruses. Proc. Natl. Acad. Sci. U. S. A. 108, (47), 19036-19041 (2011). Lee, A. S. -Y., Burdeinick-Kerr, R., Whelan, S. P. J. A genome-wide small interfering RNA screen identifies host factors required for vesicular stomatitis virus infection. J. Virol. 88, (15), 8355-8360 (2014). Mahoney, D. J., Lefebvre, C., et al. 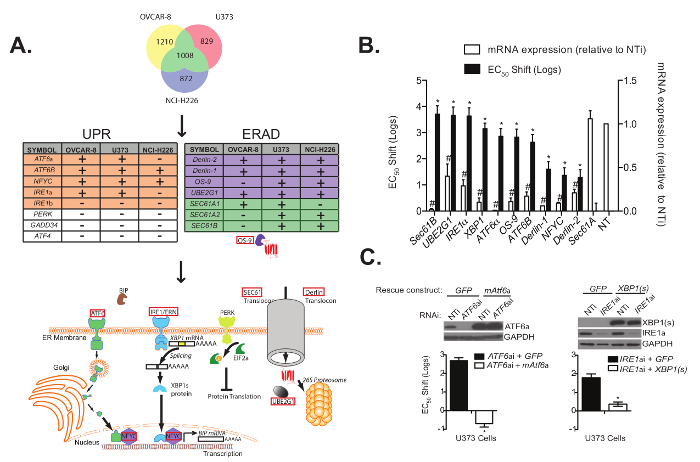 Virus-tumor interactome screen reveals ER stress response can reprogram resistant cancers for oncolytic virus-triggered Caspase-2 cell death. Cancer Cell. 20, (4), 443-456 (2011). Mahoney, D. J., Stojdl, D. F. A call to arms: Using RNAi screening to improve oncolytic viral therapy. Cytokine Growth Factor Rev. 21, (2-3), 161-167 (2010). Mahoney, D. J., Stojdl, D. F. Functional genomic screening to enhance oncolytic virotherapy. Br. J. Cancer. 108, (2), 245-249 (2012). Allan, K. J., Stojdl, D. F., Swift, S. L. High-throughput screening to enhance oncolytic virus immunotherapy. Oncolytic Virother. 5, 15-25 (2016). Lundholt, B. K., Scudder, K. M., Pagliaro, L. A simple technique for reducing edge effect in cell-based assays. J. Biomol. Screen. 8, (5), 566-570 (2003). Birmingham, A., Selfors, L. M., et al. Statistical methods for analysis of high-throughput RNA interference screens. Nat. Methods. 6, (8), 569-575 (2009). Zhang, J., Chung, T., Oldenburg, K. A simple statistical parameter for use in evaluation and validation of high throughput screening assays. J. Biomol. Screen. 4, (2), 67-73 (1999). Huang, D. W., Sherman, B. T., Lempicki, R. A. Systematic and integrative analysis of large gene lists using DAVID bioinformatics resources. Nat. Protoc. 4, (1), 44-57 (2009). Huang, D. W., Sherman, B. T., Lempicki, R. A. Bioinformatics enrichment tools: paths toward the comprehensive functional analysis of large gene lists. Nucleic Acids Res. 37, (1), 1-13 (2009). Thomas, P. D., Campbell, M. J., et al. PANTHER: a library of protein families and subfamilies indexed by function. Genome Res. 13, (9), 2129-2141 (2003). Szklarczyk, D., Morris, J. H., et al. The STRING database in 2017: quality-controlled protein-protein association networks, made broadly accessible. Nucleic Acids Res. 45, (D1), D362-D368 (2017). Luc, P. -V., Tempst, P. PINdb: a database of nuclear protein complexes from human and yeast. Bioinformatics. 20, (9), 1413-1415 (2004). Chung, N., Zhang, X. D., et al. Median absolute deviation to improve hit selection for genome-scale RNAi screens. J. Biomol. Screen. 13, (2), 149-158 (2008). Zhang, X. D. Illustration of SSMD, z Score, SSMD*, z* Score, and t statistic for hit selection in RNAi high-throughput screens. J. Biomol. Screen. 16, (7), 775-785 (2011). Zhang, X. D., Lacson, R., et al. The use of SSMD-based false discovery and false nondiscovery rates in genome-scale RNAi screens. J. Biomol. Screen. 15, (9), 1123-1131 (2010). Amberkar, S. High-throughput RNA interference screens integrative analysis: towards a comprehensive understanding of the virus-host interplay. World J. Virol. 2, (2), 18-31 (2013). Barrows, N. J., Le Sommer, C., Garcia-Blanco, M. A., Pearson, J. L. Factors affecting reproducibility between genome-scale siRNA-based screens. J. Biomol. Screen. 15, (7), 735-747 (2010). Carralot, J. -P., Ogier, A., et al. A novel specific edge effect correction method for RNA interference screenings. Bioinformatics. 28, (2), 261-268 (2011). Caffrey, D. R., Zhao, J., et al. siRNA off-target effects can be reduced at concentrations that match their individual potency. PLoS ONE. 6, (7), e21503-e21511 (2011). Makarenkov, V., Zentilli, P., Kevorkov, D., Gagarin, A., Malo, N., Nadon, R. An efficient method for the detection and elimination of systematic error in high-throughput screening. Bioinformatics. 23, (13), 1648-1657 (2007). Caraus, I., Alsuwailem, A. A., Nadon, R., Makarenkov, V. Detecting and overcoming systematic bias in high-throughput screening technologies: a comprehensive review of practical issues and methodological solutions. Brief. Bioinform. 16, (6), 974-986 (2015). Savidis, G., McDougall, W. M., et al. Identification of Zika virus and dengue virus dependency factors using functional genomics. Cell Rep. 16, (1), 232-246 (2016). Ma, H., Dang, Y., et al. A CRISPR-Based screen identifies genes essential for West-Nile-virus-induced cell death. Cell Rep. 12, (4), 673-683 (2015). Zhang, R., Miner, J. J., et al. A CRISPR screen defines a signal peptide processing pathway required by flaviviruses. Nature. 535, (7610), 164-168 (2016). Marceau, C. D., Puschnik, A. S., et al. Genetic dissection of Flaviviridae host factors through genome-scale CRISPR screens. Nature. 535, (7610), 159-163 (2016).